Highly detailed 3D models, derived from the latest aerial photography, are helping Anglian Water design, build and communicate major infrastructure and non-infrastructure asset projects across the east of England. Created by aerial mapping company Bluesky, the 3D models are being used by the @one Alliance, a collaboration of consultants and contractors working together to deliver more than half of Anglian Water’s capital investment programme. The Bluesky models are being used to create 3D animations and fly-throughs that communicate potentially complex plans in an easy to interpret and engaging way. Examples of projects where the Bluesky models have already been used by the @one Alliance include a 3-million GBP scheme to upgrade pumping stations and reduce the risk of flooding in Great Yarmouth and an ambitious project to relocate Cambridge’s Waste Water Recycling facility to Waterbeach. The Bluesky 3D models are photogrammetrically derived from high resolution stereo aerial photography. 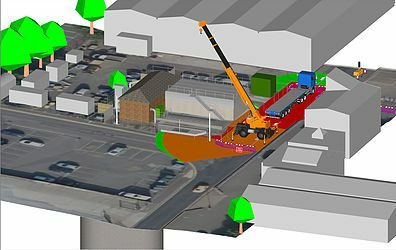 Supplied ready to use in the Google SketchUp, and onward use in Synchro the 4D construction scheduling software, the Bluesky models provide a detailed visualisation of the environment allowing for interaction, analysis and interrogation of the landscape and infrastructure. Geographically accurate, the 3D models also included a Digital Terrain Model (DTM). The Anglian Water @one Alliance comprises consultants, contractors, and other stakeholders who together will deliver projects accounting for over half of Anglian Water’s capital investment programme. The @one Alliance will design and build around 800 schemes worth approximately £1.2billion including water and water recycling treatment centres serving more than six million people in eastern England (and the Hartlepool Water region) and maintaining/improving the region’s water mains and sewerage network. Alliance partners are Anglian Water Asset Delivery, Balfour Beatty, Barhale, MMB, SWECO, Skanska and Stantec Treatment.